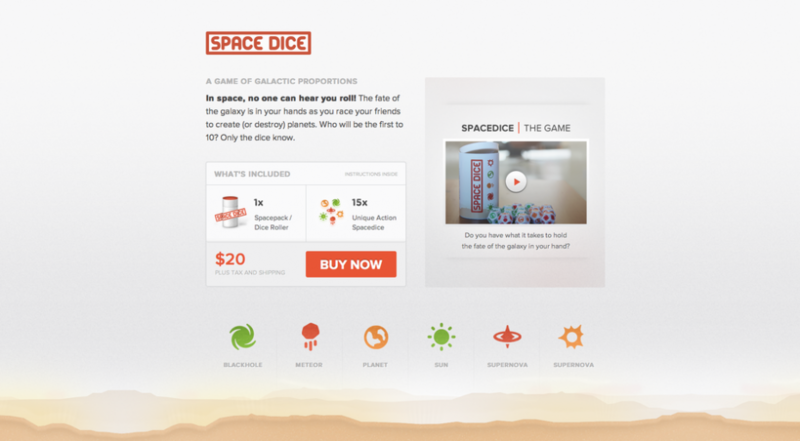 Jon Wheatley is the creator of a dice game called Space Dice which he recently wrote a blogpost about how he took from an idea to a finished product. Inside each Space pack is a whole galaxy. Fifteen dices in three different colors. Green dices bring life to your galaxy. They help you grow your score and minimize the bad that can happen. Orange dices bring uncertainty. The balance of good and bad. Red dices are the harbingers of destruction, dangerous level quitters. The goal with Space Dice is to roll as many “habitable planets” as possible, before you roll 3 black holes and make your galaxy unstable. A “habitable planet” is a planet near at least 1 star and without space debris hurtling towards it. The first person to roll 10 habitable planets is the winner. Jon is an entrepreneur from London and prior to founding dailybooth in February 2009, he worked on a number of different web projects including social music website moof.com, screenshot sharing mac application grabup.com, and online gaming website onlinegames.net that was acquired for $70,000 when he was 17. There is no real secret to it. If you make something good people will like it. If people like it people will use it. If people like it and use it they’ll tell their friends about it. If that happens people will want to buy you. Wash rinse and repeat.